The original Overcast locked its best features away. It added streaming and Handoff in 2.0, and adds patron features and better battery efficiency for all in 2.5. The Overcast podcast app unlocked all its features in shifting from a freemium model in version 1.0 to a patron-backed approach with its 2.0 release. The latest major update, 2.5, brings the first features exclusive to donors, while free users retain all previous ones and get all the general improvements. Overcast 2 added a number of much-requested features, like streaming audio, and added interesting ones, like Handoff support to allow moving among devices while retaining your current playback position. Version 2.5’s marquee additions appear mostly under the hood. Developer Marco Arment says he’s improved battery efficiency somewhat, while dramatically reducing unnecessary network file sync operations (and thus bandwidth and time). The new release also clears up a couple of rough edges I noted in the 2.0 review. Patrons receive two unique benefits in 2.5: a dark theme for the app that uses the San Francisco font, and the ability to upload as much as 2GB of audio files that aren’t distributed through podcast feeds. A patron-only dark theme may work better for night-time playing. Many were on the interface and functional side, such as Smart Speed, which identifies and skips silence during playback, and Voice Boost, which was intended to provide real-time normalization of audio to keep voices within a narrower range, preventing a lot of volume adjustment. 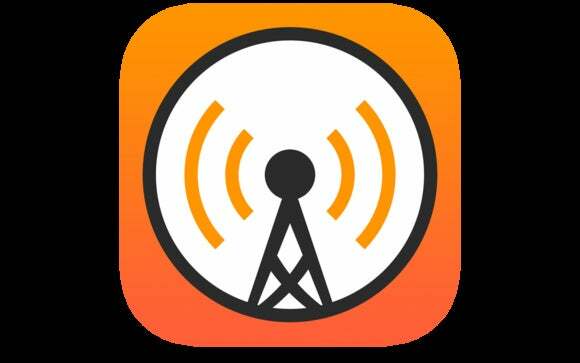 Both features could be enabled app-wide, but disabled or customized for individual podcasts. Voice Boost received additional work in version 2.5. Arment says that he tuned its performance when used with an iPhone’s speakers; previously, the profile was designed only for headphones. 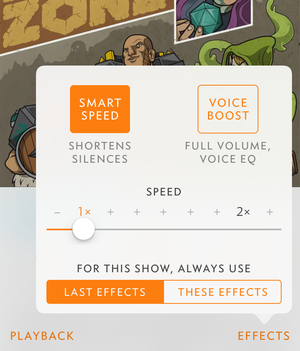 Version 2.0 added improvements Smart Speed for quieter voices, though I don’t use the feature routinely and thus couldn’t tell the difference. Overcast 1 limited its appeal by employing a freemium model. The basic version of the app limited the number of playlists and the number of episodes shown in them, and could only download over Wi-Fi. Purchase a $5 in-app upgrade, and that version added variable-speed pitch-adjust playback, cellular downloads, unlimited playlists and episodes, a sleep timer, and the above-mentioned Voice Boost and Smart Speed. 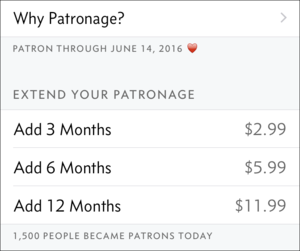 Optional patronage adds two unique features in 2.5. Version 2 supports both streaming and downloads, and offers a sometimes confusing intersection of settings. 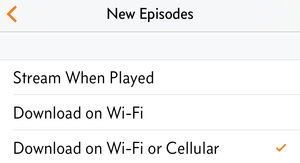 In Overcast’s New Episodes settings, you can pick among Stream When Played, Download on Wi-Fi, and Download on Wi-Fi or Cellular. However, Overcast also has an entry in the Settings app, where you manage notifications, background app refresh (for downloads), and cellular data usage. And there’s yet another entry in Settings > Cellular in the apps listing. With one misaligned combination of settings, you could have everything in the app set up the way you want, and be unable to stream or download except on Wi-Fi. In practice, given that we have a family 15GB-a-month plan (with AT&T’s one-month rollover data), I’ve made sure cellular use is enabled everywhere in Overcast. Most podcasts are in the 15MB to 60MB range, and I’m mostly on Wi-Fi networks. 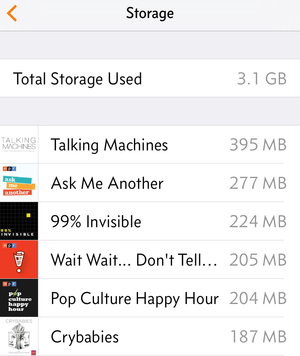 I doubt I use more than a few hundred megabytes a month for out-and-about podcast retrieval. If you’re trying to ensure you’re using the least amount of cellular and Wi-Fi data (for those with broadband plans with caps or overage fees), setting New Episodes in Overcast to Stream When Played is a good choice while also disabling Cellular Data in Settings > Overcast and in Settings > Cellular. Every podcast that appears in the main All Episodes playlist as a new episode can be tapped to start a download over Wi-Fi. Or you can use the app-wide Downloads view and download them all at once. This breaks my particular want of not managing downloads, but it’s a necessary option for some people. The streaming-by-default option also helps those with low-storage-capacity iPhones. In the previous Overcast, even with assiduous management of how many episodes I wanted to retain—which can be set per podcast and globally—I would find gigabytes of shows retained. Since I now use iCloud Photo Library and iCloud Music Library, my 64GB iPhone tends to always have ample remaining storage, even when I have nearly 4GB as I do at this moment. With an 8GB or 16GB phone or a configuration with more local music or photo storage, this can help conserve space. New to version 2 is a Storage list—in Overcast’s settings—that shows you the sum of all episodes, and then the space occupied by each one. You can tap Delete Downloads, and they’re all removed. 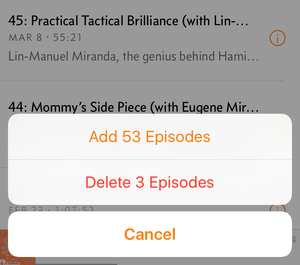 You can also swipe left on an individual episode to remove it (or on a podcast to unsubscribe), or in a playlist, tapping Edit at upper right and then selecting multiple episodes to remove at once. The swipe-left action is much more reliable than version 1, where I often found myself accidentally starting to play an episode instead of revealing Delete. A very welcome version 2.5 newcomer is Add All and Delete All. In the All view for a given podcast, tapping All brings up Add X Episodes and Delete X Episodes options. This lets you clear out all of the episodes downloaded for a podcast or download the full RSS feed worth of episodes for binging—the latter useful for fictional podcasts with continuity, lecture series, and similar cases. Version 2.5 finally lets you add all episodes or delete all locally stored episodes. Discovery is grouped into categories and becomes more powerful if you link in a Twitter account, although that’s not required. 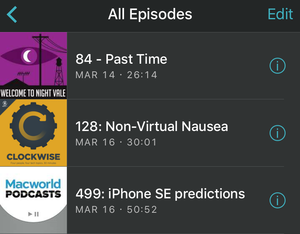 Version 1 featured curation by the developer; version 2 is entirely driven by Overcast users’ use of the Recommend button that appears with each podcast episode. 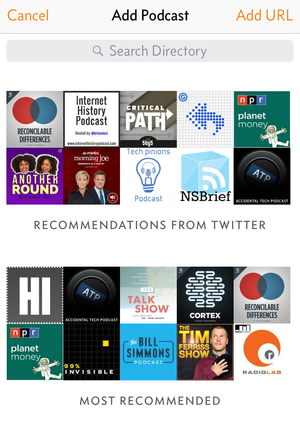 The app shows overall most recommended, most recommended by those you’re connected with on Twitter, and top shows in major categories, as well as “collections,” which are podcast networks. It’s handy. You can even tap to subscribe to all the podcasts in a set. A maddening oversight in earlier versions occurs when you tap a show in the directory to view details and then tap to subscribe or download an episode: Overcast dropped you back into its main view. To get back to the same recommendation list and position or same search, you have to repeat your actions, which is frustrating when you want to add multiple items from the same area. This has been changed for subscriptions in 2.5, keeping you in the same position, but it remains for individual episode downloads. Overcast’s playlist support is quite robust. Tap the add playlist button (a square with a plus and a list in it) in the main view, and you can set up a list that features specific podcasts, and choose one or more of those to always sort at the top, no matter your chronological sort-by choice. You can also drop in episodes outside of the selected podcasts and exclude ones from those shows you’ve picked to truly customize. After the list is created, you can select it, tap Edit, and re-order episodes; the new positions are retained. 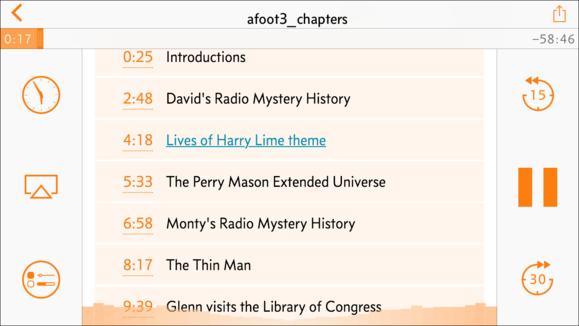 Overcast 2 properly displays chapters, showing them beneath show notes for an episode. Overcast shows chapter markers at the top of an episode’s show notes when one swipes up from the logo in the individual podcast episode playback view. They’re also displayed above the main playback interface as a centered text label with separate back/forward buttons. This works, but it’s a little wonky to discover and use. A way to switch to chapters or show them by default would help. Version 2.5 reworked the “equalizer” visualization during playback, which in version 2 showed an actual representation of the distribution of frequencies in the currently playing audio within the podcast art/show notes area. The revision minimizes the distraction and battery usage by showing it in more compact fashion within the Pause symbol. While Overcast remains an iOS app, you can also switch back and forth between a modest web app version which uses the login for your sync account, which is free. In version 2, Handoff support was improved. With a podcast playing in iOS, choosing the Safari Handoff icon in OS X brings up the web app version, which starts playing where iOS left off while pausing the iOS player. In testing, syncing back the other way either wasn’t accurate or quick enough after pausing in Safari in OS X.